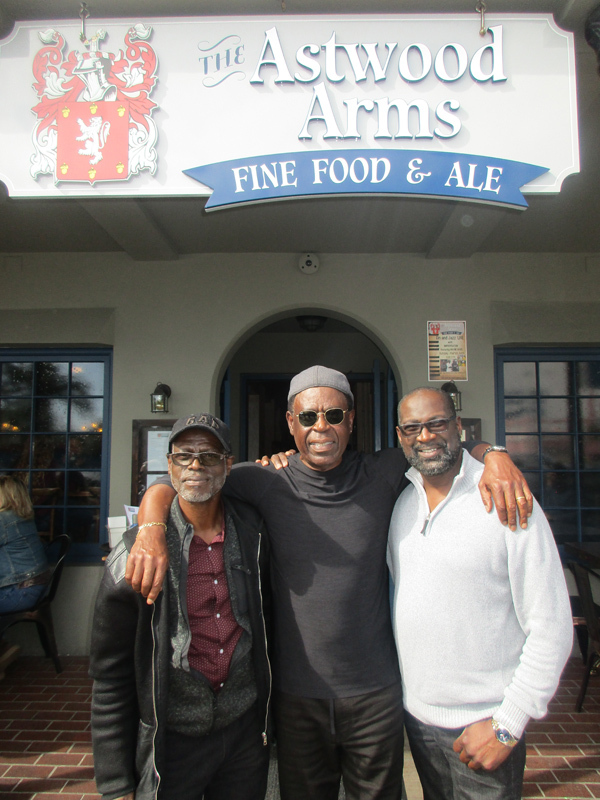 On Sunday, March 24, three veteran Bermudian musicians took The Astwood Arms at 85 Front Street by storm. Described as “a Victorian era styled pub,” it lived up to its name in style and music. From the minute you arrived, manager Mark James Connor, son of the famous Jimmy O’Connor of “The Happening BDA,” gives a warm welcome and ensures that his excellent and friendly wait staff seat you, and in quick order give you the gin and pub menus. Before you know it, you are relaxed and cheerfully snapping your finger with an enthusiastic mix of young and old music enthusiasts. Wayne Davis on piano, Derek Simons on guitar and Irvin Leader on drums have added a delightful treat to Front Street, which will be repeated the last Sunday of the month at 3.00pm. If the happiness of the crowd, tourists, and locals, who recalled the days when Sunday afternoon jam sessions were a norm, is anything to judge by, the band should be very successful. Wayne recently sent me rarely seen photos from a similar concert held at the Somerset Bridge Club in the 1970s, so it was a natural connection for me to show up on Sunday. I was not disappointed. The band could play soul and jazz classics with their eyes closed because they have performed in numerous venues all over the island for years. Maybe this is a renaissance; Wayne has an excellent voice, Irvin is very passionate and ‘Mr Cool’ Derek Simons will have you thinking of his Friday night performances at Hubies. Each musician is more than capable of doing solos on their instruments that will not bore you. They need to strongly consider that. There was a lot to enjoy from the band with songs like “Summertime,” “Love is a Masquerade,” “Stand By Me,” and “The Rose” written by Amanda McBroom. I have been to many concerts where people talk and it is hard to hear the band, but this was a quieter audience who let the band take control of the atmosphere, and this made the musicians really shine. You can sit and enjoy quite a wide selection of food from and a huge selection of gin and house drinks. There is even a menu that gives you a step by step route for drinking the stuff. I am not a gin drinker, however my Dark-n-Stormy was excellent and so was the thick cheese used on my onion soup. I saw many plates go back empty, and one customer raved about the steak and kidney pie, and another ensured his French fries were drowned in traditional vinegar. It was then that I realized that this very clean and friendly restaurant was indeed a pub; a long distance from the traditional ones I experienced in England that were smokey and always smelled of ale in the 1970s. Now back to the band. The area they played in was well lit, as compared to many that are so dark that you might as well stay home because you can’t see who is playing. The band kept up a steady stream of music, but it was when they performed “The World is a Ghetto” that Irvin set the pace on drums and the speed was picked up by Derek on guitar to the point where we all thought it was Santana playing and customers from across the path came to see this frenzied crescendo that drove us wild. It was truly worth a standing ovation! Also in the house cheering them on were Bermudian musicians Wency Woolridge and Wendy Flood. Mark set the pace when we arrived. The kitchen nourished us. Wayne and company entertained us and gave us a sample of the heartbeat of Hamilton, and the waiters were ever present. A great afternoon on Front Street was had by all. No admission charge. Dress is smart casual.